-Pay attention to the listings that are vague or without photos. It is usually some nice old lady trying rent her awesome apartment on “that newfangled internet website.” Usually everyone ignores these listings so you have an even better chance. Our landlord didn’t even list the storage, backyard, parking or laundry! I had another friend who went to a listing that said “no parking” and when she asked about it, the landlord said “I guess we can make room for your car.” Sometimes the agency managed apartments are less flexible. – Search for keywords like “view”, “sunroom”, “Mid Century Modern”, “Victorian” or “Dolores Park” without using the neighborhood search feature. You can find cool apartments that were mis-categorized and it helps you find cool houses in neighborhoods you would not have considered. 2. Word of Mouth. Everyone knows the best apartments are handed down from friend to friend as people leave the city. Ask everyone you know, post on Facebook, Twitter, etc. that you are looking. I’ve had great luck with this. 4. Be Prepared to Pounce – When you go to an apartment open house come with all your documents, copy of your photo ID, etc all organized. When I email I act very interested but no questions. Something like: “The apartment is perfect and I’m very interested in applying. We have stable income with perfect credit and can drop off the deposit today.” Save all the questions for when you meet them (and even then don’t ask too many questions, you want to appear normal, responsible and easy to work with. No questions like “I have 8 snakes, are pets ok?”) The person renting the apartment just wants to get the job done and they are trying to pick someone out of the big pile applications. If they see you are ready to commit they are going to choose you over the person with 20 questions. Make sure you get the telephone number and email don’t be afraid to use them (I’ve even made cookies and dropped them off!) It is better to be a little annoying than be ignored and forgotten in a big pile of applications (try to be extra nice and never pushy, if you are calling a lot or you’ll over do it.) I usually say something like “we are very interested and were curious if you had made a decision yet” or “we just wanted to remind you how interested we are in your perfect apartment” or “we wanted to offer to pay $100 more in rent” While you get to know them you’ll be able to realize what they are looking for in a tenant. For example, our landlord wanted someone who wouldn’t call him every week to fix something. So we told him we would manage repairs ourselves. 5. Watch for the “Cozy” Apartments. Nothing is worse than showing up to an Open House of an apartment that was misrepresented online. My personal pet peeve is when someone calls a 1 bedroom with a living room a “2 bedroom.” It’s the worst! 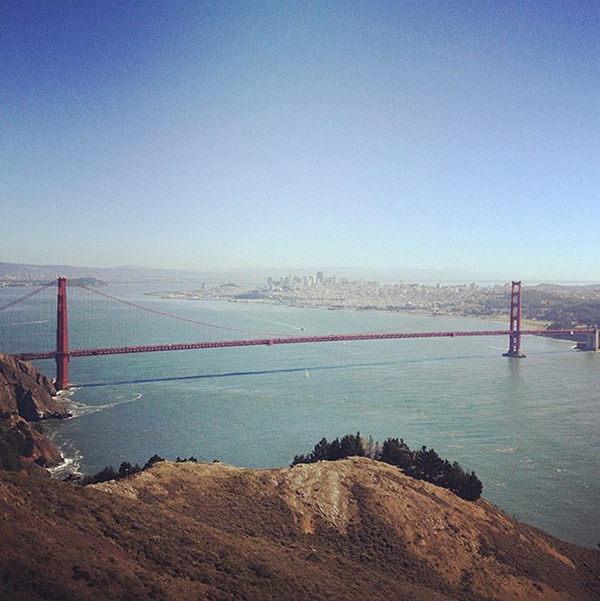 Last summer we returned home to San Francisco after living in France for a year. We were shocked to see how much the rental market had gone up (because of all the tech growth) in the 16 months we were gone. We still had an art studio on Valencia street and we really wanted to live nearby so that we wouldn’t have a long commute. We started searching on Craigslist from France and it was so depressing. Every two bedroom was dark, small and average and was way over our budget. We wanted to give up, but then I tried looking for 1 bedroom apartments with bonus rooms. I found a vague listing that was half the price of the two bedroom apartments we were looking at. It was located on the best street in San Francisco but there weren’t clear pictures or many details. I sent my brother and my friend to see the house and take pictures at the open house. When they got there it was a madhouse. People were waiting in line for the landlord to open the apartment. They sent me a lot of the pictures with the advice that I probably shouldn’t try to rent the apartment. They thought it was way too small (500 sq ft) and the apartment was in poor shape. They also told us that the apartment included a parking spot, a back yard, storage, and laundry (all unmentioned in the listing.) Even though I knew the apartment would be tight I realized that this apartment had the best location, all the bonuses we were looking for and was half the price of the other apartments. With the savings in rent we would be able to save to buy a house and we would have a landing pad for at least a year until we had more time to look for something bigger. I told them to submit an application and got the landlord’s contact information. There were over 40 applicants for the apartment. We contacted the landlord every few days to express interest even though I felt awkward contacting him so much (squeaky wheel gets the grease.) The apartment needed a lot of repairs. There was mold in the walls and the carpet had been chewed up by a dog. The walls were painted a different color in every room, and the fridge didn’t work. The landlord was having a hard time managing all the repairs because he lived outside the city. Once we arrived back I realized this process was going to take months. We were desperate and really wanted the apartment so I offered to take the apartment as-is and renovate it ourselves. He loved that idea and we met to sign papers that week. It took a couple weeks of renovations and we were ready to move in. When we were done we couldn’t believe it. Besides the size it was the perfect apartment and with the money we were saving on rent we would be able to save up for a house. We feel really lucky it worked out for us and while we won’t fit in this apartment forever (those boys are getting big!) we love our apartment. Thank you, thank you, thank you for this post. We’re hoping to move to San Francisco from Chicago in about a year, and your tips were incredibly helpful – especially the Craigslist search terms, I never would have thought of that! I’m intimidated by the application/other renter competition, because we have a dog & a cat, and Chicago has much less competition. Thank you for sharing! This is really helpful and I appreciate all of your detailed advice. And I bet the landlord loves what you guys did to it too. Win, win. Such a great post! I went through the same process a couple months ago and found that making my own craigslist ad worked for me. It’s so hard to stand out with so many people replying to apartment listings! Great story and very helpful tips! And persistence does pay off. When we found our apartment in San Francisco it wasn’t so competitive like this (it was 2007) and we were coming from New York. We came out on an apartment-hunting trip for a week and saw 40 apartments in that time. And I only wanted one (though several were really good, this one was “the one” because every room had great natural light which to me made them all usable. Anyway, despite being the only applicants and having perfect credit and stable income, the landlady (who we hadn’t met in person yet) was hesitant to rent to us and we couldn’t figure out why. Looong story short, after some sleuthing, it was because when my husband talked to her on the phone he said that I ran an online shopping site. She took that to mean I sold products online (which wasn’t the case, I just blogged about them) and that that would mean UPS and FedEx would be delivering packages all day, which would disrupt the neighbors (only one woman lived below us and she worked during the day, so it didn’t even make logical sense). So lesson learned: Be careful what you say and describe what you do and your lifestyle — less is more — because it can get misinterpreted very quickly. Now we say I’m a writer – and that’s how we ended up eventually getting the apartment. We played reverse psychology and had my husband call and ask if the neighborhood was quiet because I am a writer and need lots of quiet. After that, she changed her tune! So bloggers and freelancers, take note. Great advice! I did all of these things when I found our 1893 Victorian house on Craigslist for $15 less a month than the 2-bedroom apartment I was living in. My sister came with me to the “open house” where 20 other people, including myself, had appointments with the landlord to look at the place. We oohed and awed over the original fixtures and wood work, the backyard and the basement storage, and talked up the fact that we were historic preservationist working in the field and had lived in old houses almost our whole lives. I got the application paperwork from the landlord, filled it out for myself and my husband (who was out state at the time), and turned it in about an hour later with a payment for the credit check. Two days later we got a call that ours was the first credit check to clear and we could have the house if we wanted. SCORE. Our landlord is the coolest guy, he even gave us Christmas cookies one year! Great tips! But I have to say that stories like that make me scared to move back into the big city–40 applicants! Yikes! We are currently househunting in Phoenix, where the market is slower, and fingers crossed we find a dream home! A piece of advice to people moving to SF from far away cities who may not have the means/time to visit before the big move: Look into bigger apartment complexes. A lot of them will let you apply and sign a lease without being present. They also tend to accept dogs AND they allow short-term leases. This gives you a place to live upon arrival (always a bonus! ), some time to explore and learn the neighborhoods, and figure out where you want to be. Sure, it’s not the cute little Victorian walk-up you dreamed of, but it allows you to catch your breath for a few months before starting the crazy process of finding the perfect SF apartment! Interesting read, we are landlords in Portland, and there are strict landlord and tenant laws. We have to give first right of refusal to the first person that applies and has good credit history. Is it not the same in SF? LOVE this. As an SF family of 4, we’ve been through many of the same hurdles, and your tips are spot-on. Only 1 of the 4 SF apartments we’ve rented had pictures on the craigslist listing so we’ve had SUCH good deals (if anything here can be called a “good deal”). Our last place was bigger than a lot of 2 bedrooms but we were able to use the spacious closet (with a window & view!) as a bedroom for a couple years. Neighborhood really is key too. Great tips! Wow! The only city I’ve apartment-hunted in is Portland. It’s a competitive market, but I’ve never dealt with a landlord that “chooses” the applicant like that. It’s very much: Do they meet the rental criteria? Do they pass the credit check? If it’s a yes, then they operate first-come first-serve only! I’ve always gone prepared to sign a lease the day I look, and we’ve never missed out on what we’ve wanted. Had no idea that in other cities landlords are swayed by cookies and friendly phone calls Or maybe we’ve just been lucky? Great post!! Thanks for all the great tips! My husband and I currently live in Chicago, but we would love to move to San Fran in 2 years or so- now I will be prepared! Such helpful advice. It can be so tough rocking up to view a rental and seeing a line of 50 people outside. I walked by one last year and it looked like some hot new restaurant had opened up, but no – it was just an open for inspection! this brings up memories of my days living in SF – during the dot com boom of 1999-2001. Sometimes I would show up to open houses and find out that there were 150 other applicants for a tiny closet that was over my budget. Once I showed up to a roommate situation (I was young and single) – and found out the “bedroom” that was being advertised was actually the uninsualted back porch! Yikes! Now I live in LA, which is so much easier than San Francisco. Geez! Glad you found the right apartment. Where we live it is tricky because I wanted to live right on the beach, but our area is very very competitive – so like you, I found a rental no one wanted to deal with – and it has ended up being the perfect, quirky (small) house for our family. I am in love with this apartment series you are doing! How is the kindergarten search going? great post! i was wondering if you guys paid out of pocket to do all the renovations that were required to make the apartment livable, or if your landlord reimbursed you (at least for supplies). Seems like that could get pricey if you are paying for it yourselves. I’m currently apartment hunting in the East Bay (Berkeley) and although I’m sure it’s not quite as competitive as San Francisco it is still completely stressing me out! I would be perfectly happy to stay in our current apartment which is perfectly located and has everything we need but out landlord has put the rent up by way too much. Rentals in out apartment complex have just increased between 11.5% and 17% which is just ludicrous. The manager has explained that there has been increased demand from families who are being priced out of San Francisco – the whole reason we live in Berkeley in the first place! Add in all of the students who start looking for places close to the university at this time of year and it just becomes crazy. When we first moved to the Bay Area from Australia we really struggled to find anywhere that would accept a family with two young children. I know that it’s technically illegal to refuse to rent to someone based on the fact that they have kids but it certainly doesn’t stop landlords from finding other reasons, no matter how petty they may be. We originally looked in San Francisco for months but got knocked back every time we mentioned the kids. We moved our search to the East Bay and had more luck – although I do hear stories about families being knocked back in favour of groups of students here all the time. I rent out my home in Australia and I know that I’d always accept a family with young children over a group of university students any day! Oh, and the worst place/time I’ve ever tried to rent an apartment was in Sydney just after the 2000 olympics. The whole city was booming from the influx of tourist money and rental prices were going through the roof. Open houses would only last for 15 minutes and there would be at least 20 other couples looking at the same time. Prospective tenants were expected to pay one week’s rent with their application form. If they were knocked back they received the money back. However, if your application was accepted but you’d found somewhere better in the meantime you lost your money. If you kind of liked a place you had to take a gamble and drop off $400+ with your application. If you were going to look at four or five houses in a day this meant that you potential had to carry around a few thousand dollars incase you wanted to apply for a few. And then there was always the risk of getting accepted for all of them and losing a lot of money! Of course, with so much competition this didn’t happen too often but it was still a risk. Because there was so much competition prospective tenants would push the price up a lot too. You’d go look at an apartment that was advertised at $400 per week but it may end up going for closer to $500 per week thanks to prospective tenants trying to out offer each other. Fast forward a few years and it had all reversed! We were able to offer substantially lower than the advertised price and still great a great apartment with harbour views! “Cozy!” It’s so true, haha. These are good tips for anyone looking for a place to live in SJ. Man! You got a great place! I’m sure whoever the next tenants are they won’t get your rent rate. You guys flipped that place into something luxurious. I’m a landlord in SF. I think you really hit the nail on the head when you said [landlords] “just want to get the job done” — so any aspect of you making it easier (eg managing renos yourself) is really a selling point. Ultimately, all other things being equal (stable income, etc), we want low maintenance tenants (ppl who have common sense about fixing basic things around the flat and/or knowing when it’s important to call a repair guy) and people who take pride in their home — and by extension the property rented to them (given that you arent renting from slumlords). In all honesty, Id say the strong SF tenants rights also influences a landlord’s decision (whether they want a decades-long renter or want more flexibility in selling in the future). It can be tricky. Thanks for sharing your story! Your apartment makeover has given me a new perspective on what’s possible. You really turned an eyesore of an apartment to a gorgeous, well designed space. Bravo! My boyfriend and I have been living in Russian Hill for the past four years and we got VERY lucky when we moved here in early 2009 (the height of the recession). We managed to get a fully renovated one bedroom apartment in a nice Victorian + garage parking for a great price. Now, 4 years later, we’re both working from home and finding that we’re bursting at the seams in our current place. My desk is in our small living room and my boyfriend has his office in our kitchen! We’ve tried looking for a new place a few times over the past year, and are always really depressed by the market. Landlords here are asking the most ridiculous prices for apartments that have never been updated & with kitchens/bathrooms/appliances from the 80’s. And of course they’re being rented out at full price. It’s the pits! Your articles have got us talking, and we’ve begun our search again. We’re now keeping an eye out for the less obvious places that we can change/renovate. Fingers crossed on finding a great place! This reminds me of when I was a student at Berkeley, I really wanted to live near campus but…yeah that was way to expensive. I was just looking at craigslist for fun and hoping just maybe. Well, I found a family with a 15yr old that needed to be driven to school each day, and some wanted someone to do the dinner dishes (basically loading and unloading dishwasher) and in exchange for a free room, walking distance from campus in a BEAUTIFUL old house. It was a total craigslist miracle…in two weeks it went from unlikely dream to moved in. Craigslist in the Bay Area is really good, but you’re right there were no pictures in the ad. what a great tip list and apartment search story! I’ve loved seeing you highlight your small space. my roommate is moving out this summer so I’m thinking about how to maximize the new room I’ll be able to spread out into. thank you for the great starting place! Goodness I needed this when I relocated from Los Angeles last year! I’ve never had a harder experience then trying to find a home in SF. Ultimately we ended up in a great part of Oakland (yes this does exist) and my commute to SF is only 20 minutes. Oakland (The Grand apartments) is a great backup option and you can get a little more square footage too plus parking! These are indeed awesome tips! Finding an apartment in San Francisco is not that easy but I think this article really helps so much. Thanks for sharing all these great ideas! Two thumbs up for this post! thank you for this post. so helpful! This post is great – thank you! Jordan, I wonder if you could also comment on any difficulties you’ve experienced during the application + approval process from being self-employed. Here in NYC, I’ve had a lot of difficulty fighting out competition because of this factor – it seems landlords prefer to have “typical” tenants where they recognize the company they work for, etc. (which is somewhat understandably). In Chicago, I find it best to go to the neighborhood you want to live in and walk the streets to find “For Rent” signs. That’s how I found the last two apartments I lived in. Good to know! My husband are seriously considering the idea of moving to the bay area. Hope it pans out and everything goes smoothly when we get there! ahhhhh SF rental memories. its all about connecting with landlords. i once sat indian style (with my roommate) on the floor of the empty apartment with the home owners who were both artist, while they asked us about our jobs. they ended up picking us because they thought i was a fashion designer…i worked for an online shopping site. i just smiled and nodded! Very helpful tips.I totally agree, good apartments comes from word of mouth and recommendations! This is an awesome post. The SF rental market is super hot right now, so I know your tips will help many others. I’ve also had a lot of success by bringing a six-pack of beer! When we moved back to San Francisco last year we fully intended to move back to our old neighborhood (the Richmond). After spending way too much time and money with nothing to show for it we gave up and checked out the East Bay. We ended up in Alameda, where my husband’s commute to his financial district job was about the same, time-w more than $1,000 less than what we thought we’d have to pay in SF, even for the dumpiest of 2-BRs in our old neighborhood!! I can’t say I didn’t; really miss the Richmond,, but in markets like these those moving into the city — and therefore maybe with a little more location flexibility, and perhaps a tight time frame — should at least consider being open to other areas. In Alameda we went through an agency and paid a small (30% of one month’s rent) fee payable at time of signing the lease, but it was worth every penny. We had recently gone through the apartment rental process in New York, which we thought was bad, but apartment hunting in Manhattan was a piece of cake compared to San Francisco. My husband and I just moved from a beloved one-bedroom across from the Oakland Museum into a big old Victorian house east of Lake Merritt. Hunting for a house was awful. I spent a full month on Craigslist, and I visited so many places that were “eh” or “almost right” or “just plain WRONG on so many levels” (those seemed to have the nicest landlords though). The place we’re in now was posted once but without an email address, and I was crushed when repeated “tell me your email address” pokes through CL resulted in nothing. A week after giving up on what looked like the perfect place, another ad came up but all in Chinese. I contacted the owner and set up a meet, and ohmygah it was the same house! She’d posted different pictures and in a different language because she hadn’t had one person respond to the first post (ha ha guess why). She had other people apply, but she ended up choosing me and my husband because we GUSHED about the awesome job she’d done renovating it, and when I turned in my application I brought her a basket of clementines and croissants at Chinese New Year. We also offered to help build the fence she was going to put in the back yard, which I think sealed the deal! My advice to people is always to be patient. There are so many places that would “work”, but there’s a perfect place out there somewhere. What a great story! I’m curious, did your landlord give you a budget for the renovations, or did you have to pay out of pocket? I find this whole discussion very sad. It’s frustrating that landlords are allowed to be discriminatory based on the fact that potential tenants *might* have lots of packages delivered, *might* have lots of visitors, or have two children who *might* make noise! Such a shame that you have to bribe your way in with cookies, fruit baskets or beer, or even more seriously, doing the renovations yourselves. Thank you for your post! After 3 years in our beloved (but small) SF apt, now we have our first baby on the way, but we’re not going anywhere because 1.) we love it, and 2.) it’s rent controlled. So we’re going to make every square inch in this apartment count. After seeing the photos of your place, you’ve convinced me I can do this! Our SF rental story (in case it helps anyone): My husband and I moved to SF in January 2010, just before the rental prices went crazy. We had 48 hours to find an apartment, and the second our plane landed we went to our first craigslist appointment. The moment we saw it we knew it was “the one”. We just knew. But of course there were lots of other folks interested. I needed a way to make our application stand out. I wrote the land lord a personalized letter telling him how special the apartment obviously was and we thought maybe it would help his important decision if he learned more about us, the applicants. So I told him about myself and my husband’s background, how we met, where we went to school, that we wanted to find a place to make a home for many years. I sent him the letter, said a little prayer, and nervously waited. The next day, he called and he chose us. Looking for an apartment in San Francisco is not that easy especially if one is new to this place. There are a lot of things to consider before deciding the perfect spot. This article gives so much wonderful ideas in apartment hunting. Ant it’s awesome! These tips really counts so much. Thanks for sharing! My Husband starts his job in SF this week and looking for housing for us right now. Thanks for your tips! Thank you so much for the advice. I am a grad student at USF looking for a place in the fall and I will be moving over the summer. I feel like I am starting the search too early but everyone who has moved to SF from cities far away keep telling me to start as early as you can so you can find a great place. Everyone in the south is creeped out by Craigslist so this advice definitely helps me. Thanks again!